Butter and line the bottoms of 2 (9-inch cake pans) with parchment paper. Preheat the Oven to 325˚F. Beat 6 large eggs with 1 cup sugar 5 minutes on high-speed. Heat 5 Tbsp honey in a saucepan over medium heat until it is very hot, but not boiling (about 125˚F), stirring often. Just as soon as you see faint bubbling on the edges, use a spoon to stir in the 2 tsp baking soda into the honey stirring continuously until your mixture turns a yellow/light caramel color (about 30-45 seconds seconds) and immediately remove from heat. It will be fluffy. It will continue to cook even after you remove from heat. Continue stirring until you're finished adding it to the egg mixture. You don't want it darker than a yellow caramel by the time you are ready to add it to your egg mixture and it happens quick so don't step away from it! With the mixture on high speed, add hot honey to the egg mixture about 1 Tbsp at a time so you don't cook your egg mixture. Also, don't wait for your honey mixture to cool down or it will harden and you won't be able to blend it into your egg mixture. Reduce mixer speed to med/low and blend in flour 1 cup at a time. Use a spatula to scrape down the mixing bowl to make sure the flour is well blended. Just as soon as the flour is well incorporated, divide into two prepared baking pans and bake at 325° for 25-28 minutes or until the cake is golden brown and a toothpick comes out clean. Once they are cool enough to handle, remove from the pans and transfer to a wire rack to cool completely. Beat the heavy cream until stiff and spreadable (1-2 min on high speed). Once your cake is completely cooled to room temp, slice your cake layers in half and keep the halves stacked until ready to assemble so your cake doesn't dry out. Order of layers (assemble the cake on your serving platter). (A) First cake layer (B) enough frosting to cover the layer (C) 1/3 of your chopped prunes (D) thin layer of frosting on the bottom of the next cake layer (like putting mayo on both sides of bread for a sandwich), then repeat steps (A-D). 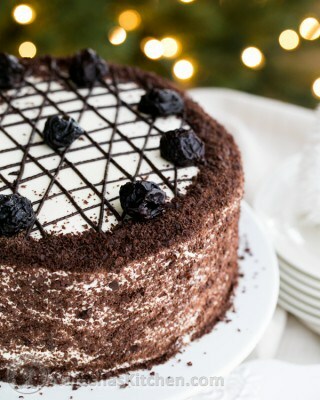 Frost the outside of the cake and sides then decorate with a checkerboard design of piped strips of melted chocolate, chocolate shavings and more prunes.